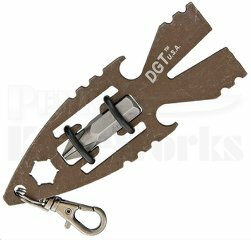 Darrel Ralph DGT Gear Aero 3" overall multi-tool. One-piece stainless construction with a battle worn finish. Features: bottle opener; pry bar; flat head and #2 Phillips head screwdrivers; hex key; and attachment clip.